Prepare to be amazed by a blast from the past. I took a welding class about 3-4 years ago. That's right this blog post has literally been years in the making! The class was offered by a local vocational school and was geared as adult continued education. I learned arc weld, MIG weld, brazing, and how to cut steel with an oxyacetylene torch. This was my basic welding setup. 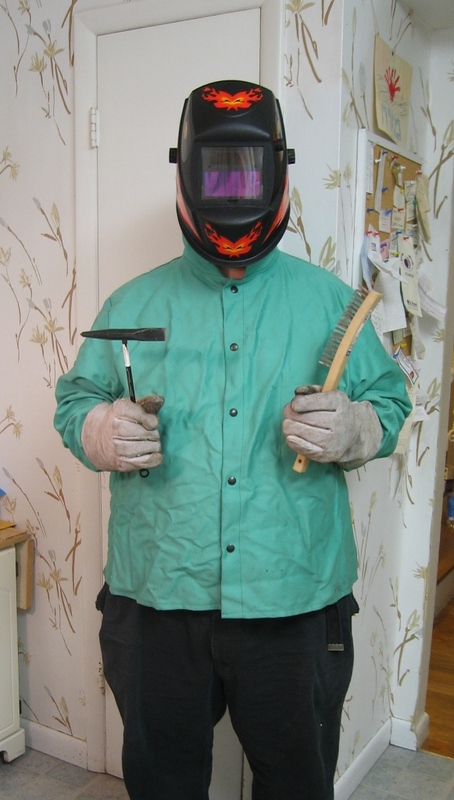 I had an auto-darkening helmet, this meant that when I struck an arc the goggles immediately darkened so I wasn't blinded, but when I wasn't welding I would be able to see what I was doing. Additionally, I am wearing a welding coat, its treated cotton. Also, thick leather gloves. On the right is a wire brush for cleaning up welds and on the left is a welding hammer, its to clear off slag. This is my brazing and oxyacetylene cutting getup. 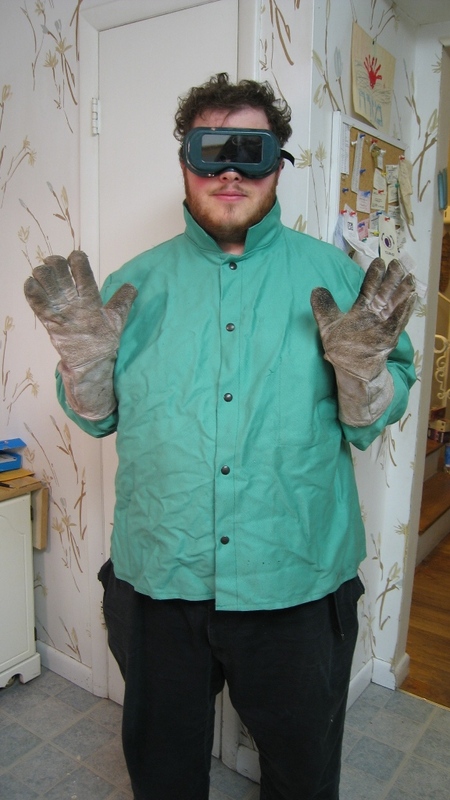 Same shirt and and gloves but wearing brazing goggles. On the theme of a long time coming, I was clearly way ahead of the times. Watch out guys, we're dealing with a badass over here. Let me also add that those gloves (actually, a second not-used-for-welding pair) make excellent oven mitts. Looks so cool! Especially for the helmet. Precautions is always better, So choose the best welding Helmet, Gloves, Boots, Jackets for your safety. I think your welding mask is amazing. Where do you buy it and how much ?